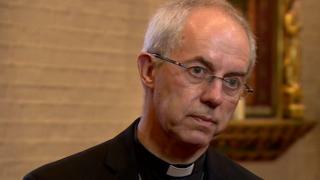 The Archbishop of Canterbury, Justin Welby, has said faith communities "must go the extra mile" to work together, during a speech at Cardiff's City Hall. He was at an event to mark the 10th Anniversary of Cardiff University's Centre for the Study of Islam in the UK on Thursday. The Muslim Council of Wales helped to organise the event for over 400 guests as part of National Interfaith Week. First Minister Carwyn Jones was chief guest at the event. Archbishop Welby said faith groups must "compete with each other in the service of the common good". "In our genuine, truthful and loving communication and action lies the challenge to fear, the building of the common good. Take courage, let us work together," he said. The context of the meeting was, he added, was "fear in many places". However, he said it was "remarkable" that Islamic teaching on just war was "very similar indeed" to that of Christianity. "Our faiths, coming from different theological presuppositions, recognise the value of the human being and the dignity of the human being," he added. He said faith groups were the "glue in society in so many ways". "We have unequivocally to condemn those who misuse our own scriptures for their own ends," he said. "But condemnation, a negative, is not enough." The mainstream of each faith needed to generate a "counter-narrative" that acknowledged their differences and committed to "support one another in defiance of those who wish to divide us", he said. "Most importantly, we have to unconditionally and unilaterally seek reconciliation." Saleem Kidwai, secretary general for the Muslim Council of Wales, said the evening would provide "a space to learn from each other" and to "build bridges of understanding between us".